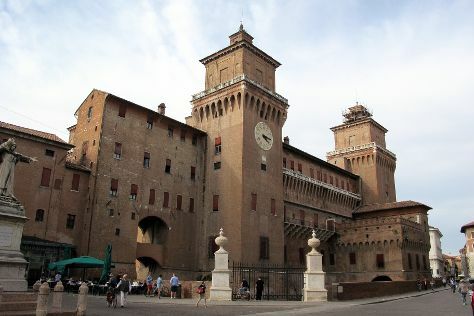 With surrounding medieval walls and network of 15th- and 16th-century architecture, the city of Ferrara is often deemed the Heart of the Italian Renaissance. Start off your visit on the 12th (Mon): get a sense of history and politics at Castello Estense. To find reviews, other places to visit, and more tourist information, read our Ferrara road trip app . Paphos, Cyprus to Ferrara is an approximately 9.5-hour combination of flight and train. You can also do a combination of bus, flight, and train; or do a combination of bus, car, flight, and train. The time zone changes from Eastern European Time (EET) to Central European Time (CET), which is usually a -1 hour difference. Expect a bit cooler evenings in Ferrara when traveling from Paphos in August, with lows around 21°C. Cap off your sightseeing on the 13th (Tue) early enough to go by car to Cervia. Traditionally a quiet community on the central Italian coast, thousands of visitors flock to Cervia each summer to enjoy its 10 km (6.2 mi) of sandy beaches and temperate coastal weather. Kick off your visit on the 14th (Wed): find something for the whole family at Mirabilandia, take in the architecture and atmosphere at Basilica di Sant'Apollinare in Classe, steep yourself in history at Basilica di Sant'Apollinare Nuovo, then take in the spiritual surroundings of Basilica San Vitale, and finally make a trip to Mausoleo di Galla Placidia. To find reviews, photos, where to stay, and other tourist information, read our Cervia road trip planning tool . You can drive from Ferrara to Cervia in 1.5 hours. Other options are to take a train; or take a bus. Traveling from Ferrara in August, you will find days in Cervia are little chillier (34°C), and nights are about the same (20°C). Wrap up your sightseeing on the 14th (Wed) early enough to drive to Bologna. You'll find plenty of places to visit near Bologna: Florence (Uffizi Galleries, Galleria dell'Accademia, & more). It doesn't end there: take in the architecture and design of Academya Lingue. To see other places to visit, reviews, traveler tips, and more tourist information, read our Bologna road trip site . Traveling by car from Cervia to Bologna takes 1.5 hours. Alternatively, you can take a train; or take a bus. In August, daily temperatures in Bologna can reach 36°C, while at night they dip to 22°C. Finish your sightseeing early on the 18th (Sun) so you can take a train to Modena. Kick off your visit on the 19th (Mon): examine the collection at Acetaia Giuseppe Giusti, examine the collection at Panini Motor Museum, see the interesting displays at Casa Museo Luciano Pavarotti, then learn about winemaking at Acetaia Villa San Donnino, and finally relax in the rural setting at Antica Acetaia Villa Bianca. To find other places to visit, more things to do, ratings, and other tourist information, use the Modena trip itinerary builder site . Modena is just a short distance from Bologna. In August, plan for daily highs up to 36°C, and evening lows to 22°C. Finish your sightseeing early on the 19th (Mon) so you can take a train to Parma. On the 20th (Tue), contemplate in the serene atmosphere at Cattedrale di Parma, then get outside with Centro Ippico La Torretta, then experience rural life at Consorzio Vacche Rosse, and finally take in the spiritual surroundings of Battistero di Parma. Get ready for a full day of sightseeing on the next day: indulge in some culinary diversions at a local gastronomic tour. For where to stay, photos, maps, and tourist information, read Parma journey builder website . Traveling by train from Modena to Parma takes an hour. Alternatively, you can drive; or take a bus. In August, plan for daily highs up to 35°C, and evening lows to 21°C. Wrap up your sightseeing by early afternoon on the 21st (Wed) to allow time for travel back home.